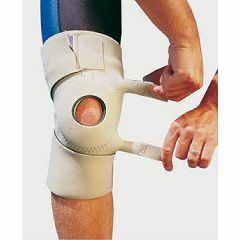 Neoprene Knee Support wraps around the leg, fitting the superior and inferior portions independently. You control the compression. One size fits all. Also available with Preloaded Patellar Pull. Fits thigh circumference up to 25", calf circumference up to 23"
Have knee pain and this fit the bill for me. Like it because it is light weight, adjustable, and provides the support I need.